Compatible with total-etch or self-etch adhesives. Bonds to all substrates. Excellent adhesion to dentin, enamel, CAD/CAM blocks, ceramic, porcelain, resin and metal. Low film thickness for use with veneers. Optimal handling. Easy cleanup in gel state. Contains fluoride and is radiopaque. The NX3 risk-free trial kit contains OptiBond All-In-One, which requires refrigeration; this kit is stored under refrigeration at Safco. NX3 cement does not require refrigeration. Contains: 1 x 5g syringe, 8 automix tips. Contains: 1 x 1.8g syringe. Trial kit – use this on an evaluation basis. Mixing tips have a brown hub, clear barrel, and white mixer. NX3 was evaluated by 26 consultants in 307 cementation procedures. This product received a 97% clinical rating. 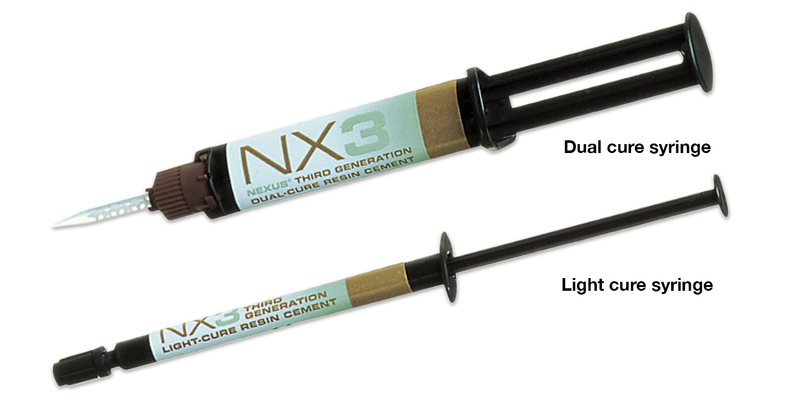 NX3 is a light- and dual-cured esthetic resin cement that is compatible with both total- and self-etch adhesives. It contains nano-fillers for improved handling and polishing properties. The choice of delivery system includes an auto-mix, a dual-cured cement (base/catalyst) and a single-syringe, light-cured (base) for cementation of multiple porcelain laminates. The auto-mixing dual-cured syringe can be used for all indirect cementations including laminates, inlays, onlays, crowns, bridges, posts, and office CAD/CAM-fabricated restorations. The amine-free initiator system provides color stability for both the light- and dual-cured cements for long-term esthetics. The water soluble try-in gels are matched to the light- and dual-cured cements. The manufacturer recommends Optibond Solo Plus and Optibond All-In-One adhesives with NX3. NX3 is packaged with a compact instruction manual and an excellent laminated instruction card, which has large, easy-to-follow illustrations. 95% of the consultants responded that they prefer a resin cement kit containing both the light- and dual-cured cement. The delivery system for the light-cured and the auto-mix, dual-cured cement eliminates the need for mixing and allows placement of the cement directly into the restoration. The viscosity and shade selection of both cements work well for all types of restorations. Working and setting time were judged to be very good. Ease of excess cement removal before the final set, esthetics, and lack of postoperative sensitivity were rated as excellent. The cement is compatible with both total-etch and self-etch adhesives. 100% of the consultants found NX3 to be equal to or better than the current resin cement they were using, and 100% would recommend it. 84% would switch to NX3. NX3 earned 4.1 stars out of a possible 5.0. Adequate shade selection without going overboard. Amine-free, dual-cured version works reasonably well even with OptiBond Solo Plus and All-In-One when it comes to seating full coverage restorations. The viscosity of the cement itself is on the thick side, which should keep its loyalists happy. Handling of dual-cured version was considered just about ideal and it doesn't require refrigerated storage. The consistency of the try-in pastes makes them reasonably easy to use. The try-in pastes also match the cement closely except for two variances. Base shades are sticky and somewhat thick -- extra care needs to be taken when seating very thin veneers. Opaque white is not very opaque. The syringes of light-cured base shades are much too small and expensive. Directions, especially the technique guide, look good on the surface, but many of the details make no sense at all. Evolutionary modifications give it wide appeal, but its demerits keep it from moving to the top spot.